How do you instill in your family a sense of godly heritage while everyone is eating hot dogs and watching fireworks? While it may seem impossible, you can pass on values important to the Christian faith while celebrating year-round holidays--even those rarely celebrated holidays like Presidents' Day. In Holiday Living, author Brenda Poinsett gives readers something to celebrate--an indispensable guide to living up the holidays in Christian style. Covering almost 20 holidays, readers will find fascinating history about how the holiday started and more importantly garner a better understanding of their faith connection to the holiday. 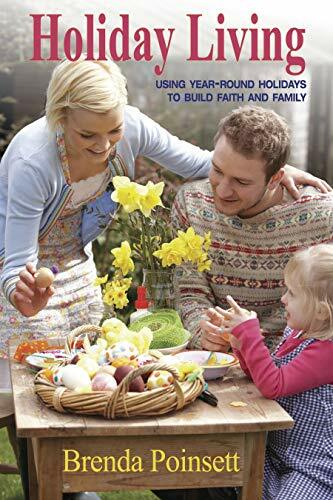 In the true spirit of celebrating life in Christ, readers will find easy-to-use, cost-effective holiday ideas to help turn facts into memories and provide opportunities to lay the foundation of Christian values as they worship. In addition to the major holidays, holidays include Martin Luther King Jr. Day, Presidents' Day, as well as cross-cultural holidays like Cinco de Mayo, St. Patrick's Day, and Kwanzaa. Brenda Poinsett works with women who want a new lease on life and with adults who want to learn and grow. At retreats, conferences, and special events, Brenda offers encouragement and hope along with valuable information. She works at perfecting her communication skills through memberships in the National Speakers Association, Toastmasters International, and Advanced Writers and Speakers Association. Along the way she came to see writing as another important avenue for sharing life-changing knowledge. She's the author of more than 19 books, including He Said What? !, Not My Will, The Friendship Factor, Wonder Women of the Bible, When Saints Sing the Blues, and Holiday Living. Brenda and her husband, Bob, have three grown sons, a daughter-in-law, and three grandchildren.